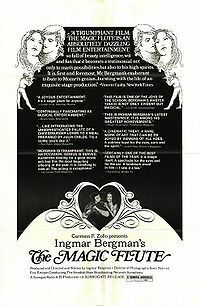 The Magic Flute (Swedish: Trollflöjten) is Ingmar Bergman's 1975 highly acclaimed film version of Mozart's opera Die Zauberflöte. It was intended as a TV-production and was first shown on Swedish television but was followed by a cinema release later that year. The film was shown at the 1975 Cannes Film Festival, but wasn't entered into the main competition.